Triage and prioritizing patient care is an important skill that Emergency Medicine physicians must develop to become efficient and effective providers. Previous studies have demonstrated statistically significant delays in door to provider time due to race and volume in the ED (Okunseri 2013, Sonnenfeld 2012). No previous study has investigated variances in door to provider time based on chief complaint. If such a relationship exists it would be useful to compare perceived and idealized prioritization to actual resident behavior. Additionally, inclination of residents to avoid or delay taking on patients with certain complaints may highlight educational needs. Is there a relationship between door to provider time, or in this study, “patient pick-up time” and chief complaint? All adult patients presenting to a single, academic Emergency Department (ED) from August 1st 2012 – July 31st 2013. This study revealed a statistically significant difference in resident pickup time among chief complaints. 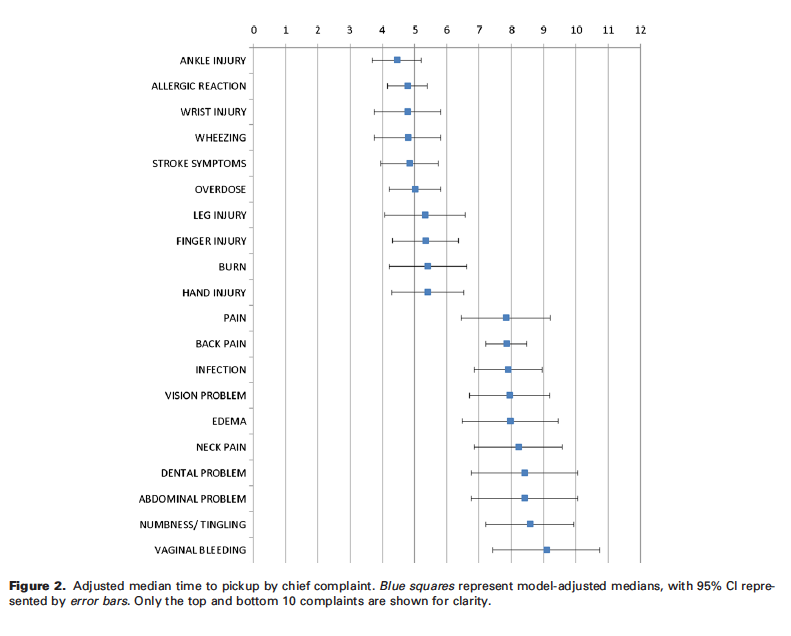 Residents in this study took longer to pick up patients with particular chief complaints (i.e. vaginal bleeding, back pain, numbness/tingling). Although statistically significant, it is unclear whether the relatively small differences in pick up time (3-5 minutes) have any clinical relevance or whether these differences persist after training. This may reflect a preference for cases with simpler workups, less diagnostic ambiguity or avoidance of possible uncomfortable patient interactions. Residents should be mindful of their potential biases, specifically towards chief complaints that may be personally difficulty or have a nebulous workup. Awareness of these biases can help prevent the development of gaps in fund of knowledge and remedy existing gaps. Current evidence, although limited, suggests that residents preferentially choose patients with simpler workups with less perceived diagnostic ambiguity.